This post was originally published on the Joint Roadmap blog on 11 May 2018 and is reposted here under the licensing terms of the original post. Hypothesis is proud to be one of the organizations participating in this worthy project. A group of organizations building nonprofit, open-source tools for scholarship and publication has joined with open-science researchers in a new collaboration to develop a Joint Roadmap for Open Science Tools (JROST). While open technologies and services are becoming essential in science practices, so far, there has been no holistic effort to align these tools into a coherent ecosystem that can support the scientific experience of the future. To draw this missing map, we’ve formed the Joint Roadmap as an informal group of like-minded people and organizations with shared goals. 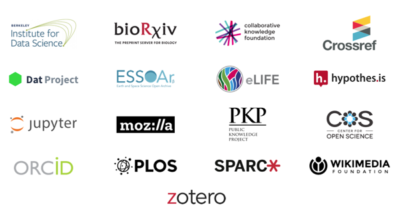 To date, the following organizations are participating: Berkeley Institute of Data Science (BIDS), bioRxiv, Collaborative Knowledge Foundation (Coko), Crossref, Dat Project, Earth and Space Science Open Archive (EESOAr), eLife, Hypothesis, Jupyter Project, Mozilla, Open Science Framework (OSF), ORCID, Public Knowledge Project, Public Library of Science (PLOS), Scholarly Publishing and Academic Resources Coalition (SPARC), Wikimedia, and Zotero, joined by researchers: Samantha Hindle and Daniel Mietchen. Through workshops and other coordinated activities, the Joint Roadmap will bring together technology organizations and researchers who are actively involved in the design and production of open scholarly infrastructure. Our objectives will be to explore shared goals and outcomes, develop cross-platform user stories, and identify obvious areas of mutual collaboration. What do our future roadmaps look like and how are they compatible or divergent? What integrations should we consider? What actions or paradigms should we all support? How do we design our tools so they improve researcher effectiveness; help research be more findable, accessible, interoperable and reusable; enhance publication and discovery; and together create a whole greater than the sum of its parts? As our first wider public activity, we are participating in the 2018 Mozilla Global Sprint during Thu 10–Fri 11 May. Join us during or after the #mozsprint to help envision the roadmap and begin to make it happen. Comment on JROST’s #mozsprint record. Review and contribute to existing issues. Connect related projects that are also part of #mozsprint or not. We are also planning our first face-to-face workshop, tentatively scheduled for 21-22 August, 2018 in San Francisco, California. Find out more about the Joint Roadmap and how you can join our growing community to create a more powerful future for researchers. Please Contact us us for more information.